Hey, remember that one time I was pregnant? 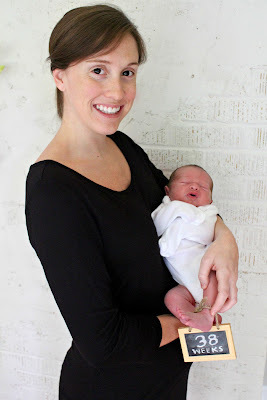 Yeah, I'm about seven weeks late to the pregnancy party, but I still thought it would be fun to share the last bits of my pregnancy here on the blog. Just a little chance for me to reminiscence on the good ol' days of peeing every five minutes and looking like I swallowed a basketball. Sound good?! As you guys know, I documented my pregnancy with weekly photos of my growing bump. Well, almost weekly photos. Sometimes the nausea and complete lack of willpower to stand in front of a camera and look cute meant we skipped a week or two here and there. So yes, a couple of these are fudged, but that's quite alright with me. 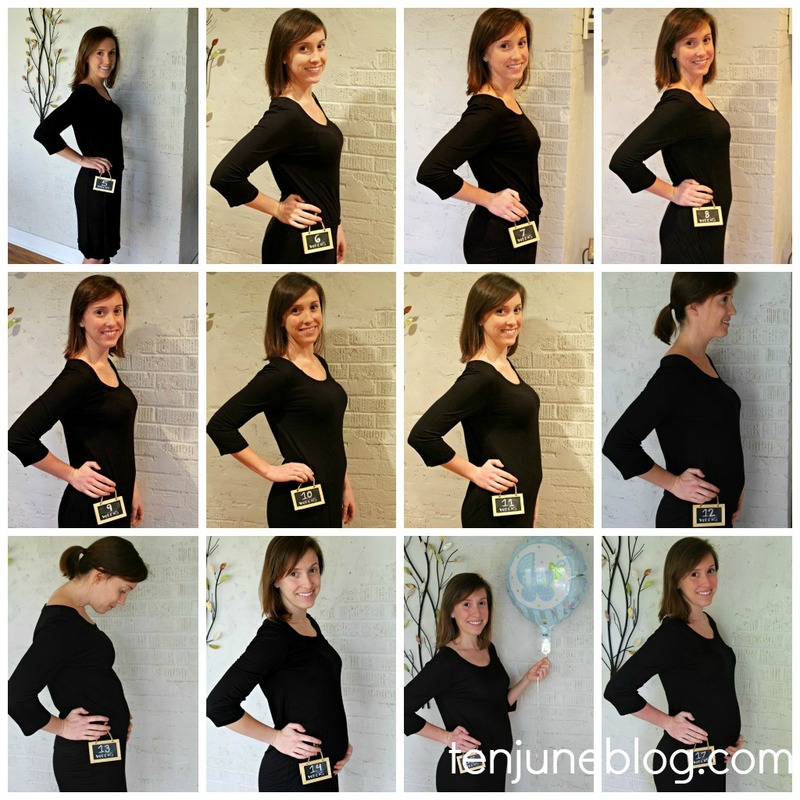 Most of these were taken on time, from week five of my pregnancy until week thirty-eight, when I delivered. Pretty fun to watch the evolution of the bump, right?! I love that I wore the same dress the whole time, which made the bump growth look even more dramatic. It was a pain to keep up with each week, but David and I are definitely glad we have these photos to look back on! Here are the money shots: week five, week thirty-seven and week thirty-eight. Isn't it funny how the look on my face goes from "yayyy! I'm preggo!" to "holy cow, I have a friggin' watermelon in my stomach" to "I'm so happy but can't keep my eyelids open because I'm so tired." Yeah, I'm still in that last phase, that's for sure! I decided to keep the weekly photo tradition going with Baby H. Well, bi-weekly at least. I've been snapping shots of him with the same little chalkboard since his first week. It's so much fun to see how much he's grown already! Little man is going to be walking, talking, graduating college and taking his seat in the Oval Office before I even know it! What? My kid's going to be President, I know it. I'll be sure to share H Dawg's bi-weekly photos soon. Speaking of... I've been meaning to ask. Do you guys like hearing about the bambino? 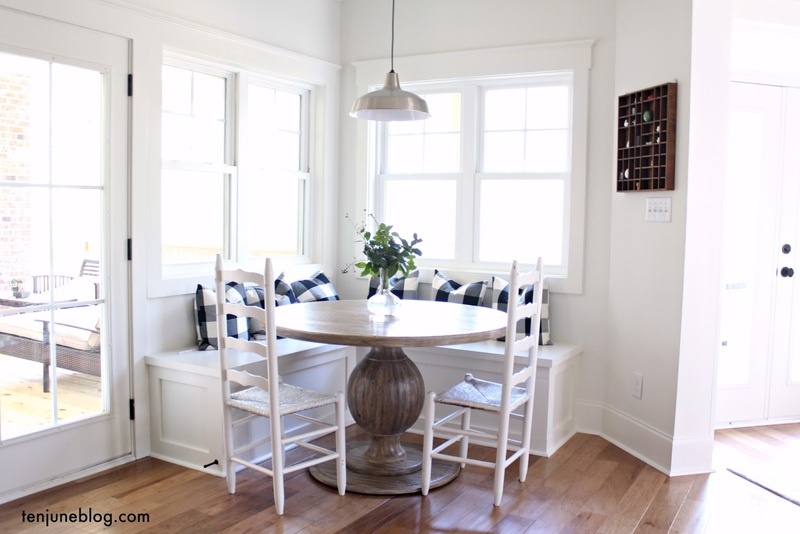 Or would you rather me keep this blog all home decor + DIY? I've been curious, so I thought I'd ask. I love these pictures! Such a good idea!! Great blog! Keep it real! You have a baby, it is hard to not share stories. Personally, I like blogs that are true to the person's life. 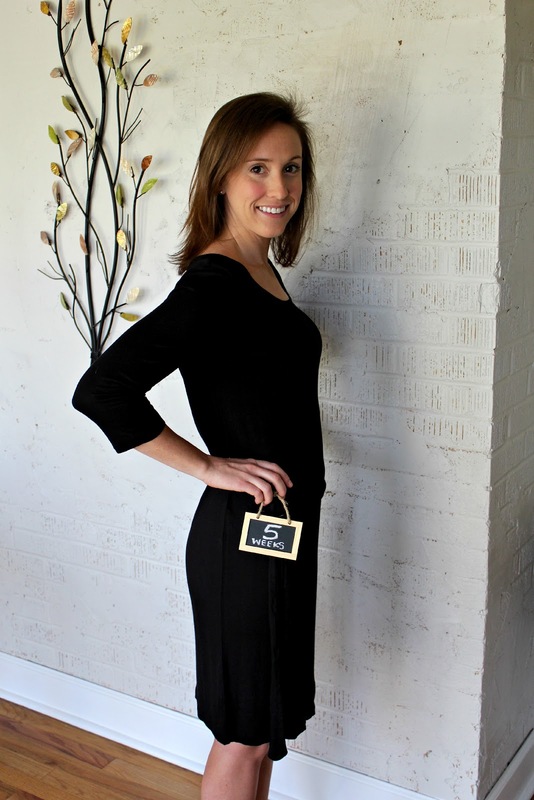 Also, those baby bump pictures are awesome! I love the baby updates! I am pregnant with a baby boy and my husband and I are redoing our house. I love reading it all! Clearly I'm biased but I LOVE hearing updates!! And it's so fun to see your progression! You rocked that pregnancy!! I wish you would post more about him! You really rocked pregnancy, cutest belly ever. I love hearing all the updates, he sure is a cutie! Love this!!! You are adorable. And great way to keep that in memory! you are too cute! and love how you literally just stayed the same size everywhere else except your little belly! I love the baby updates also! And I am amazed that you managed to wear the same dress for every pic - we just started TTC but I hope when the time comes I can manage the same thing! 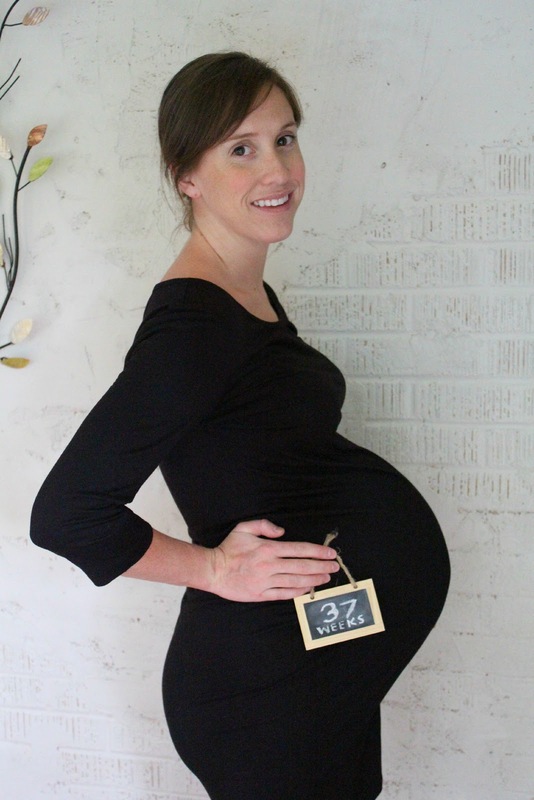 I love the updates and the idea of progressive pregnancy pictures! It's totally something I want to do whenever I get preggers! You were adorable throughout! Final picture is the BEST! Please keep featuring the bambino. I love hearing about the great bambino and pictures make it even better! I LOVE the bambino updates! Keep 'em comin! You were such a cute pregnant lady. You looked great the entire time and I love the progression. I am still a little sad because I lost my hard drive at week 32 and lost all my pregnancy photos. I was taking them in front of our kitchen chalkboard. Sigh. I lived and learned. And now I'm just thanking my lucky stars I didn't lose all of Henry's photos. oh my gosh, that is awesome that you took those photos! you were a precious preggo lady! I think i looked like your 38 weeks at my 18 weeks, ha. What a great idea and it's great to see the progression! Good for you for documenting your pregnancy so well! and CONGRATS!!! What a precious little one you have. You look great by the way. Love that! 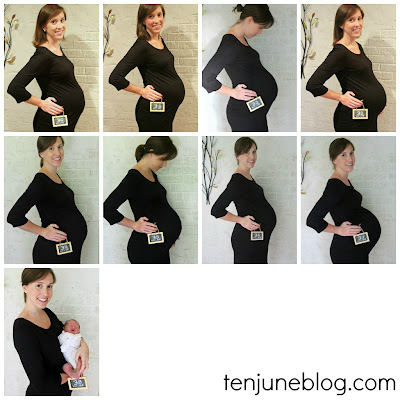 I did monthly photos with my 1st pregnancy, too. Did you use Photoshop to put all the pictures into the collage above? I am SO far behind on everything, but I love hearing about the baby! You guys are such a precious family! I love the photo shoot idea to document your bump and I can't wait to see how the baby's photo shoots are turning out! Love reading all the post's about Baby H. Your such a pretty new mom and the baby is too cute! I love these baby bump shots! I recently found out I am pregnant and hope to do the same kind of thing. Where did you get the dress you are wearing? So cute! Wonderful idea! May I ask what dress you got that stretched to Week 38?